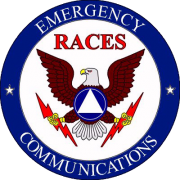 RACES, the Radio Amateur Civil Emergency Service, was established in 1952 by the FCC. It was an outgrowth of the old Civil Defence organization that existed during World War II. RACES can only be activated by a local government agency. Recent history has shown that when traditional communications fail emergency communications via amateur radio get the job done. RACES is activated for earthquakes, major fires, flooding, problems at nuclear power plants as well as other local disasters. FCC regulation 47 CFR 97.407 describes RACES. The regulations limit the amount of time that can be spent in drills, the type of communications that can be transmitted, and the frequencies that can be used if the War Powers Emergency Act is invoked. Putnam County RACES is activated by the county Bureau of Emergency Services. Since all RACES members come from PEARL, their are no RACES meetings. All activities are talked about at the regular PEARL general membership meetings. RACES plays a major part in Putnam County's plan for problems at the Indian Point nuclear power plant. RACES is involved in radiological monitoring and reporting, school evacuations, and decontamination centers. Training for these activities is provided by Putnam County. RACES is evaluated yearly by New York State and/or FEMA observers in Indian Point Drills and has never received a negative report from the observers. The ARRL, American Radio Relay League, published an article about PEARL doing radiological monitoring and reporting in the November 2010 issue of their monthly magazine, QST. The article, entitled "Amateurs Supply Critical Support to Nuclear Exercise" reports on PEARL's role in the yearly Indian Point drills. PEARL appears to be unique in doing work usually done by paid professionals in other areas. Even the FEMA observers have commented that they have never seen another RACES group that does field team monitoring.